popcorngirl12 | What's Cooking at the Genua's? This post is from many years ago but since it is Cinco de Mayo I thought I’d repost it! 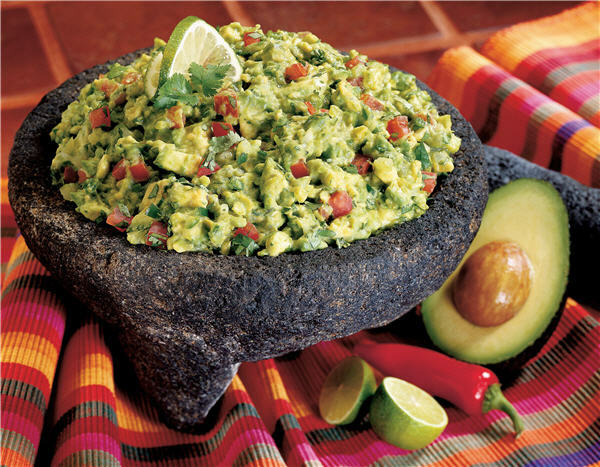 Guacamole isn’t just for Cinco de Mayo either! Enjoy it every day if you want! 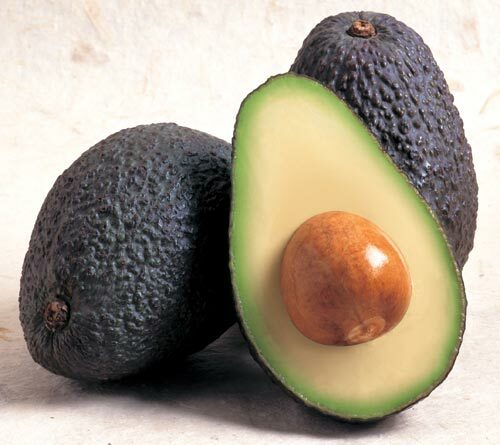 Avocados are good for you! 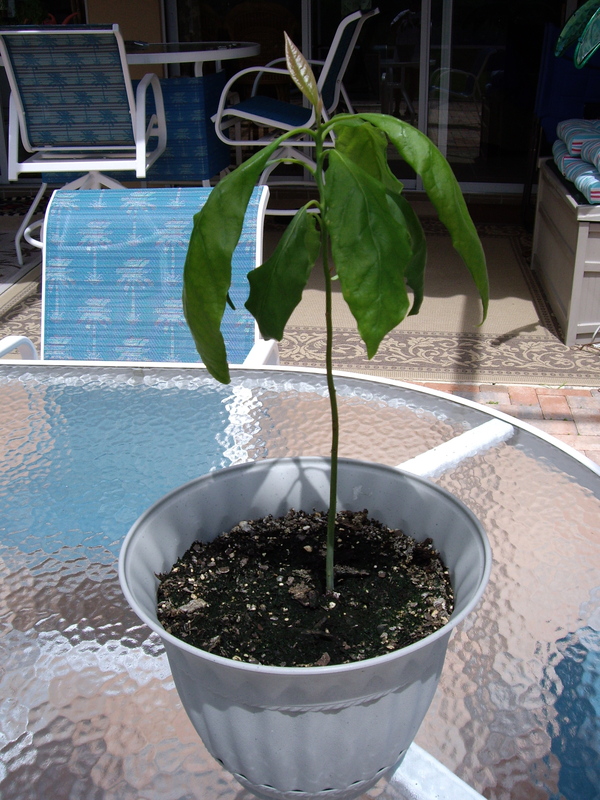 An update on the avocado “tree” I had all those years ago…It didn’t last. We don’t have the proper surroundings for it. Living with an extremely strict HOA we can’t have ANY kind of fruit trees outside our screen enclosure. So my little tree is no more. Very sad. As promised I am posting the recipe for the French Onion Dip/Soup Pizza I posted pictures of the other day. This recipe came from Rachael Ray. It actually aired on her show back in 2009 but I just came across it now. If you want to see the video and original recipe click on French Onion Dip Pizza. When I first saw this recipe I was hooked. If you love french onion dip or french onion soup and pizza then you will love this recipe. My one word of caution is to give yourself time to make it. Caramelizing onions is NOT a quick process. I would say this recipe took me a good 90 minutes from start to finish with all the prep and cooking. It’s not complicated at all either. Just time-consuming. I also made the recipe as instructed, for the most part. I did add an extra clove of garlic (duh!) and an extra onion. I also added a bit more on the cheese. (again, duh!) She also calls for Parmigiano Reggiano cheese, but come on, I’m not made of gold. I used Locatelli Romano. The Gruyère cheese in this recipe was my big splurge. And don’t leave out the thyme leaves. I actually have never cooked with fresh thyme before, I know, hard to believe. What was I thinking? It totally made the pizza. The flavors just exploded in my mouth. I will be making this pizza again for sure. Another thing I learned when pre-baking the crust, I will also poke tiny air holes in it with a fork before baking. I didn’t do that when I made this and it puffed up so big all I could think of was that Little Rascals episode with the cake that kept expanding on the sides. I was able to flatten it but I was nervous. Baking the crust prior is definitely a must otherwise the pizza will be very soggy. Using a large skillet, on medium, heat the olive oil. Add the onion and garlic and gently cook, stirring occasionally until the onions are soft and deep golden brown. This takes about 25 minutes. Be careful not to let the onions get crispy. As the onions are cooking prep your pizza dough on your pizza pan, baking sheet or whatever you use. Poke tiny air holes with a fork through the dough. (remember we don’t want a balloon to appear!) Bake the dough until light golden brown, about 15 minutes. Keep an eye on it to make sure it doesn’t get too brown. When the onions are done, season them with salt and pepper and stir in the sour cream or creme fraiche. Spread this mixture over the pre-baked crust. Sprinkle the cheeses over the onions. Sprinkle the thyme over the cheese. Remove from oven carefully and let sit for a couple of minutes. Slice it up and serve! Be careful it’s HOT! Enjoy! I think just about everyone loves chicken wings. But after a while they can get a little boring. Same thing all the time…We have a favorite wings place here in Florida called Hurricane Wings. (They’re on Long Island in NY now too!) They have lots of different flavors along with the usual hot stuff. So the other night I remembered I had a bag of frozen wings and wanted to make up a batch. Well as most of you know, I love garlic. Can never have too much if you ask me. I also love butter and parmesan cheese. So why not combine them all with the chicken wings! Wonderful idea. What I liked most about this is that I didn’t have to defrost the wings first. I just followed the directions on the bag. Baked them for 45 minutes at 400ºF. My oven also has a convection option so I used the convection roast setting. I also turned them over a couple of times during the cooking. We love crispy wings and if you do them this way you won’t have all the extra fat from deep-frying. I am happy to say they came out awesome! We also served them with the usual blue cheese dressing. I also didn’t have any celery so I cut a cucumber into long slices and that worked just fine. I’m thinking of making up another batch for tonight! Follow cooking directions on bag of chicken. Different cooking times for frozen or thawed. Place the chicken wings on a cookie sheet or roasting pan and cook as directed. This will take 30-45 minutes. Meanwhile in a medium bowl combine the melted butter, garlic, basil and oregano. Add ¼ cup of the parmesan cheese. Mix well. 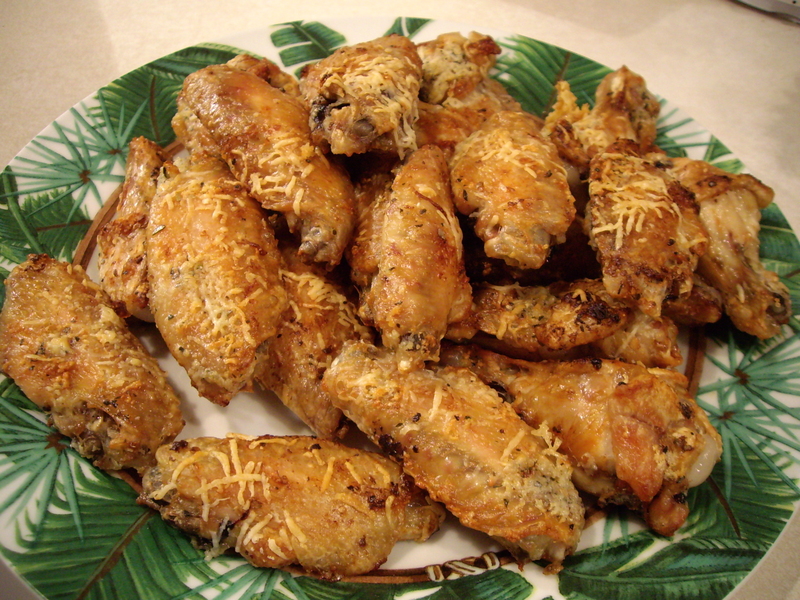 When the wings are done to your liking, we like them crispy, remove from cookie sheet and put them in a large bowl. Add the butter, garlic mixture to the wings and mix well. Put the wings back onto the cookie sheet, making sure you get all the mixture on them. Sprinkle with the remaining ¼ cup of parmesan cheese. Broil for about 5 minutes about 3-4 inches from the broiler element. Keep an eye on them so the cheese doesn’t burn. Remove from oven and transfer to a platter and dig in! Yes I said “fun with couscous”. 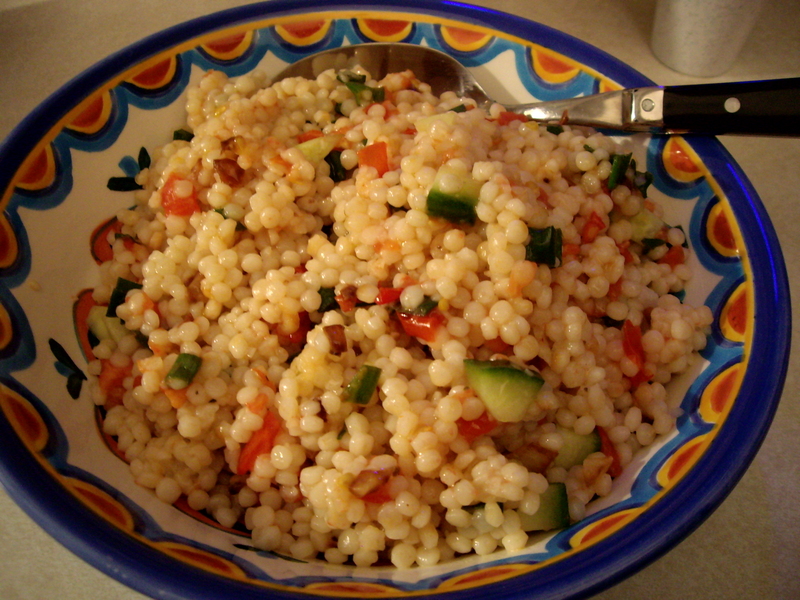 Recently I discovered Israeli Couscous or Pearl Couscous. I had seen it in a recipe some time ago and had a hard time locating it so I gave up. Then I was in my favorite Italian grocery and came across it. It was also a BOGO so I bought it! Of course by now I couldn’t remember or find the recipe I originally wanted it for! But it didn’t matter, I was all about finding a new recipe or recipes. For those of you who say you don’t like couscous, this is a great variety to try. It’s much larger than normal couscous and had a wonderful silky texture. It’s not grainy like the regular variety. First time I made it I served it cold! I had some leftover tomatoes and cucumbers and made a Mediterranean style cold salad with it. It was a huge hit! I served it at a barbecue at my house and people were asking for 2nd and 3rd helpings! So of course I’ve made it several times since! Not to get into a rut with my new-found side dish I decided to make a hot side dish last week. This time it came out like a creamy cheesy risotto! OMG it was incredible! And it only took about 10 minutes to make! Did I mention this couscous only takes 8-10 minutes! No constant stirring, no long drawn out process, just a quick and easy side dish that you can add ANYTHING to. I’ve even added it to a soup instead of noodles! I am all about the couscous these days!! It’s possibilities are endless! So today I am going to include both my cold recipe and my hot risotto style recipe. Enjoy and go buy some couscous! 1: Boil liquid and add couscous. Cover and simmer 8-10 minutes. Watch it carefully so it doesn’t overflow. Stir occasionally. 2. When the liquid is all gone, drain and rinse well under cold water. 3. Add rest of ingredients, mix well and add a little olive oil (1-2 tablespoons). Mix again and chill. 4. When ready to serve place in serving bowl and drizzle a little more EVOO over the top and mix. 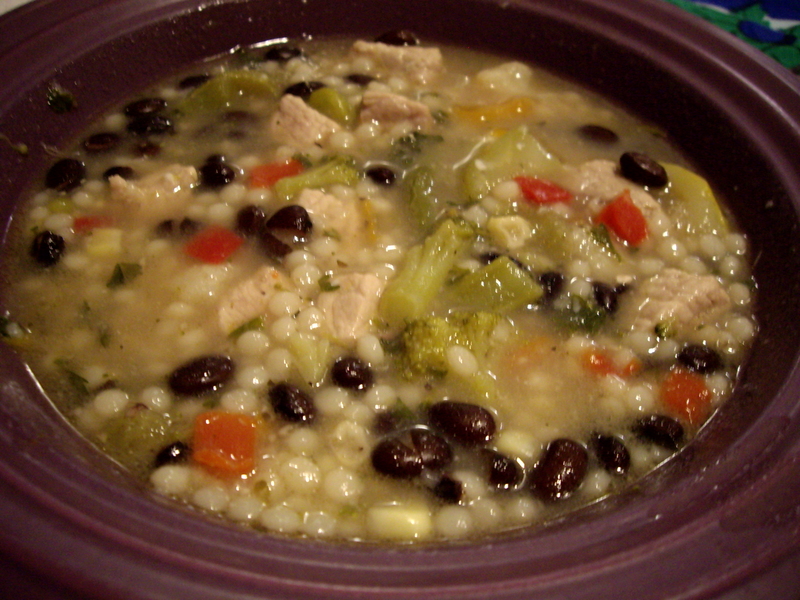 *This recipe I used what I had leftover in the fridge to add to the couscous. I had made broccoli rabe the night before so I chopped it up and used that. You can also add chopped mushrooms or anything else you wish. Even change the cooking crème variety. Make it yours! 1. Boil liquid and add couscous. Cover and simmer 8-10 minutes. Stir occasionally. 2. When liquid is gone, keep heat on low and add the veggies, cooking crème and parmesan cheese. Stir well till heated through.